Pomsky being the newcomer in the group of designer dogs, there is no doubt that he is one of the most loving dogs you can come across. This may explain why they are loved so much. As already mentioned, this dog is one of the newest designer dog. It has one of the most fascinating evolution stories. In fact, if you had asked someone about Pomski dog 5 years ago you would not have got anything close to an answer. The first recorded appearance of a Pomeranian Husky mix dates back to 2009. Do Pomeranian husky mix have health issues? 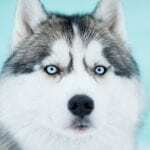 On Dec 17TH, 2009 a person posted on a website justanswer.com seeking to know about the mental stability of a Pomeranian and Siberian Husky cross breed he wanted to adopt from a local rescue center. It is at this point that the question of Pomski came to light. Dr. Scott a veterinarian replied by saying that it was unlikely that such a breed existed. He further says that there may be a confusion on which breed the person was asking about. 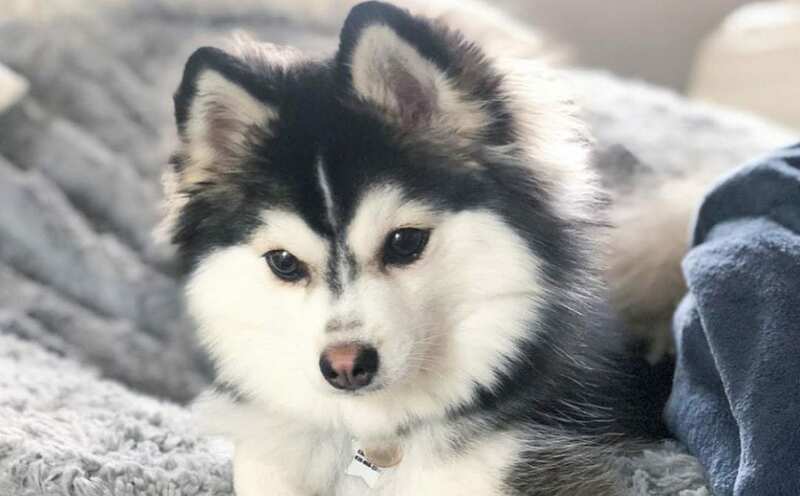 However, after reviewing the photos of the dog in question, Dr.Scott confirmed that there were actually Siberian Husky genes in the dog’s appearance but he still had doubts about the Pomeranian. Despite the fact that the entire situation was just a mix-up, the idea of Pomsky was born. 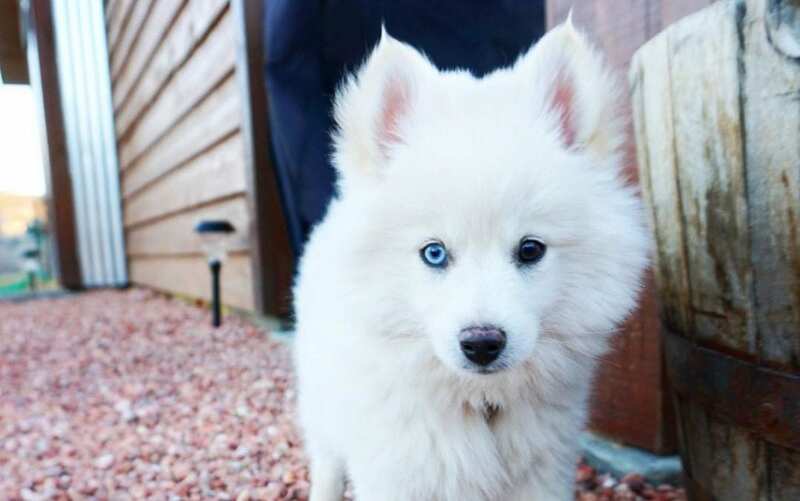 Pomski is a cross breed between a Siberian Husky and a Pomeranian. So Pomeranian husky mix is lovely with beautiful colors. Mainly they are black and grey almost similar to the Husky, however, there are some color pellets of the Pomeranian from time to time. This breed is usually made up of standard sized dogs. The smallest of the group would weigh around 10 pounds while a full grown Pomsky weighs around 15 pounds. However, their weight is not fixed. 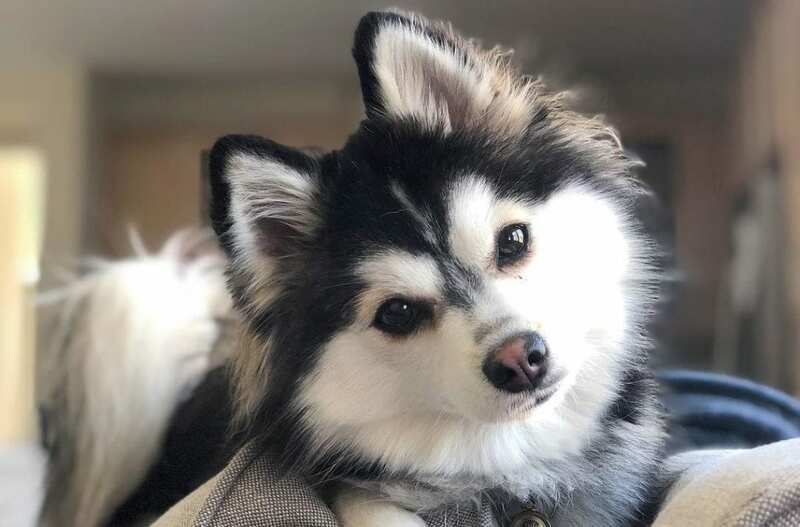 Some Pomskies can grow and weigh up to 20 pounds but this is in rare cases. These Dogs are characterized by their playful nature. While they are usually classified as moderately active dogs, they do not like being kept idle. When you keep your Pomski idle he/she will get bored. They are generally loving and gentle with children. This is a plus for the Pomeranian Husky mix considering how rough some dog breeds can get with kids. They are one of the smartest breeds and are easy to train. What is the life expectancy of a Pomsky? The lifespan of a Pomeranian Husky largely depends on how you treat him/her. Most dogs live a shorter life than their actual lifespan due to diseases and unhealthy feeding. However, the good news is that the Pomsky is a designer dog and maybe more resilient to diseases. Research has shown that the mixed breed dogs have fewer chances of developing health issues as compared to the full breed ones. In general, the lifespan of a Pomeranian Husky ranges between 12 and 14 years. However, they may live up to 16 or 17 years with proper care. Considering that the Pom sky Dog is a cross breed of the Siberian Husky and a Pomeranian, you need to combine the lifespans of the two breeds. While Husky Pomeranians may be healthy and lively dogs, they are also at risk of being sick. Pomeranian husky mix with health complications is more likely to have a shorter lifespan. In fact, the issue of dental disease is so common among Teacup Pomeranians than other dog breeds. This may be the main reason why the same problem follows the Pomsky. The remedy to this is brushing your dog’s teeth. You don’t have to do it on a daily basis but it has to be on a regular basis. You should also make sure that your Dog has a dental checkup by a certified veterinarian at least twice per year. Most pet parents always forget to take care of their children’s teeth. Pets’ dental hygiene is just as important as your dental health. The issue of dental disease among dogs should not be limited to the Pomeranian Husky Dog breed. It is not surprising that most people will ask about dog’s intelligence before they buy it. No one wants to bring a dog home that will just be sitting there without understanding what is going on. This is the reason why you need to interrogate the intelligence level of any dog before you buy it. The Pomeranian is one of the smartest dog breeds of all times. The Siberian Husky, on the other hand, may not be as smart as a pomeranian but is also very smart too. This answers the question of how smart Pomsky is. Pomskies are among the smartest designer dogs. They are easy to train and can easily interact with humans. However, some Pomeranian Huskies tend to be smarter than others. There is no a particular explanation to it. The same way smart parents can give birth to children with different intelligence levels so does the Pomeranian Huskies. One characteristic intelligence is curiosity and cheekiness. The curiosity of Pomskies cannot be underestimated. 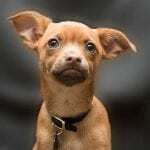 Since these dogs have inherited the intelligence of their parents, they also come with the same curiosity and stubbornness of their parents. How do you train a Pomsky? It will be in your best interest to start training your Pomeranian puppies at an early age. Once the Pomskies mature, changing their way becomes almost impossible. For this reason, you should only buy a adult Pomsky when you are sure that they have the right training. There are no questions when it comes to etiquette. A dog must be disciplined if you want him/her to be your friend. Start training your puppies as soon as they have been vaccinated. It is usually good to enroll your Pomski in a puppies class where he/she will learn to interact with other dogs and people. 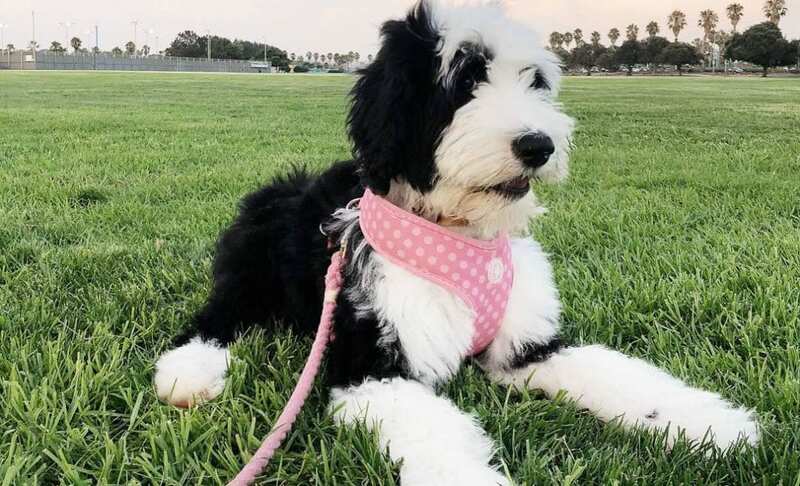 While the class will teach your dog most of the basic skills, you should also take time to socialize with your Dog at an early age to create a bond and set boundaries. These darlings will quickly accept your commands and make your life a joy when you teach them early. As cute as Pomskies may be, they also shed their hairs. In fact, they shed their hair more than other breeds. Their coat is thick layered and double covered. The undercoat is the one that is completely shed off each year. This means that if you get affected by vacuuming hair and fur, you need to stay away from Pomskies. This then brings us to the question if whether they are hypoallergenic. A dog being hypoallergenic means that it does not cause any allergic reaction to those who interact with it. There are various myths about dogs being hypoallergenic. The fact that a dog sheds does not stop it from being hypoallergenic. There are various factors about dogs that may cause allergic reactions. This may include their smell, saliva, and fur among others. It is, therefore, important for every allergic person to realize what specifically causes their allergic reactions. When considering the Pomskies, the main cause of concern is the fact that they shed. This will mean that anyone who is allergic to fur and hair should not have any interaction with the Pomeranian husky mix. This will mean that Pomsky is not hypoallergenic. However, if your allergies are drawn from other reasons you may still have Dog. In a nutshell, the answer to a dog being hypoallergenic is not black and white. However, if you can’t stand a dog that sheds, stay away from a Pomski. Pomskies are generally more expensive than other puppies. This may be due to the fact that they are overhyped and are still limited in number. Different breeders offer different asking prices. Generally, the price will range from $1000 to $ 3000 per puppy. However, some breeders may ask for as much as $5000. The prices of Pomskies also vary with looks and size. 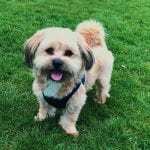 Most people are looking for small size dogs when going for designer dogs. Therefore, a Pomsky that is relatively smaller in size will cost you more than the others. The fact that there is no a standard price for dogs makes it even hard for an average person to acquire one. The other alternative to paying the hefty prices is to adopt one. However, the chances of finding a Pomsky just waiting for you in a shelter are rare. In fact, most Pomskies are already booked even before they arrive at the shelter. The good news is that once the demand gets too high, the reproduction of the same breed will increase. Maybe sometime in future when the prices come down everyone will be able to own a Pomsky. As already mentioned above, the health condition of your dog will determine its lifespan. While mixed-breed dogs are generally healthier, it should not be an excuse for laziness. All dogs need proper vaccination, feeding, and hygiene. If you fail to provide any of the three your dog is most likely to develop health complications. Here are some of the health complications that may affect Pomsky. All dogs are at risk of suffering from heart conditions. This is especially true when you do not feed them properly and when they do not exercise. The main heart disease that may affect Pomski is dilated cardiomyopathy. In most cases, the symptoms of heart diseases will not show until the disease has progressed. To protect your Pomsky puppies, keep a keen eye on symptoms such as coughing, loss of appetite and breathing problems. If you spot any of these symptoms call a veterinarian. While there is no evidence that Pomeranian Huskies can suffer from collapsing trachea, it is common among small breed dogs. This means that your Pomsky could also be a victim. Some of the early signs include breathing problems, coloration of gums, coughing and exercise intolerance. Some of the common treatments for this condition include Bronchodilators and antibiotics. Although these medications won’t heal the disease, they may increase the lifespan of your dog. In some cases, surgery may be done. However, this is usually not possible for dogs above the age of 6. This is a condition that affects the Dogs vision. The progressive eye disorder usually occurs in stages. The dog will first lose its night vision and then lose the entire vision. The good news is that most dogs can easily adapt to life without vision. This condition is not painful but can be managed when diagnosed at an early stage. Another disease that may cause vision problem is known as Juvenile Cataracts. This simply refers to the opacity of the lens. Dogs that develop cataracts at an early age are usually victims of genetic transfer. The good news is that this condition is very rare in Pomeranian Husky puppies. However, the possibility of occurring in mature Pomskies exists. Veterinarians do not recommend treatment of cataracts in dogs unless it causes total loss of vision. Pomeranian Huskies. While the exact cause of the disease is not known, it is speculated that it may be caused by blood circulation issues. The best way to make sure that your dog does not get this diseases is to keep him/her active. Some of the early symptoms include limping and tiredness. When the disease progresses it may cause lameness and mass wasting which may lead to death. If you see your dog experiencing difficulty in movement, that does not result from physical injury, you need to consult a veterinarian immediately. The black-skin disease is a condition where the dog experiences loss of hair and may lead to other skin complications. This disease is common among Pomeranians. Given that Pomsky holds pomeranian genes, it is at a high risk of suffering from the same condition. The best protection measure is to ensure that your Pomski is always clean. Treat the hairs and bath your dog with antiseptic detergents to avoid any skin infections. As already mentioned, the main health risk to Pomeranian Husky is dental problems. This is due to the fact that their mouths are very tiny. Their teeth are somewhat crowded creating a haven for bacteria to thrive. The best way to ensure that their teeth remain healthy is by regularly brushing them. If you have the energy to do it you can brush them daily, but be doing it thrice per week should be enough to protect your dog from any dental infection. Pomskies are one of the smartest mixed breed dogs. This means that they can easily master commands and follow instructions. The fact that they are easy to train however does not mean training will be a walk in the park. They are also very stubborn. While training the puppies is not a big deal, the grown Pomeranian Huskies will not learn anything from you. As they say, “you cannot teach an old dog new styles”. Teaching a adult Dog will be more problematic than you can imagine. 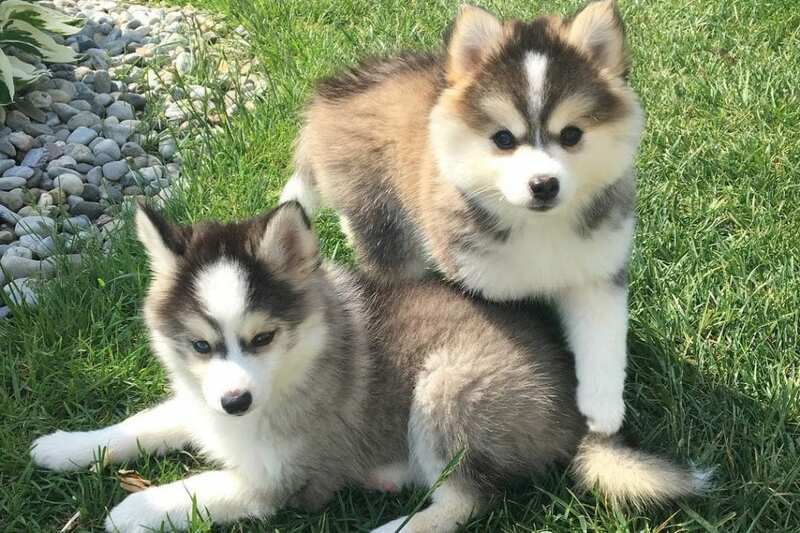 If you are looking for a dog to train, go for the Pomski Puppies. As already mentioned, start your training immediately after vaccination. If you find training them impossible, contact a dog trainer or enroll them in a class. The process of choosing the right breeder is very crucial for anyone who is looking for a dog. No matter what breed you are looking for the breeder plays a crucial role in the overall character and personality of your dog. 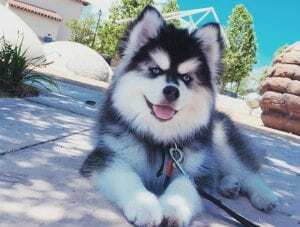 When it comes to Pomskies, There is little information about their breeding and chances are that most breeders are gambling other than sure with what they are doing. This should be your first point of concern. Here are some few tips to help you find the right breeder. First, ask to meet your breeder face to face. You should avoid doing business online when looking for a dog. During your meeting, you need to ask how long the breeder has been breeding Pomskies. Do not buy Pomeranian Huskies from inexperienced breeders. The breeder should have successful bred Pomskies before. 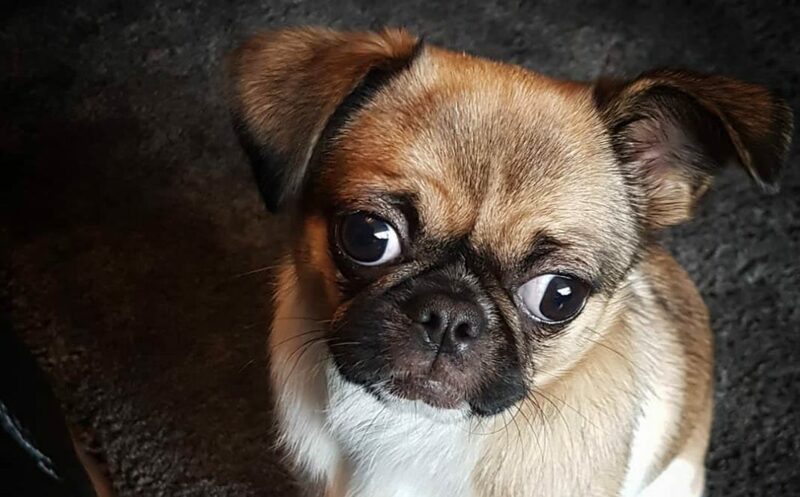 Avoid buying from first-time breeders since they may not have the best puppies for you. Secondly, examine the breeding environments. The major factor of concern when it comes to the environment is the social life. When you bring a puppy home, you want her to be part of your family. A good breeder always finds a way to make the puppies part of their family. Even if not the family, they have personal time with people and experience socialization from an early age. Training a social dog will be much easier. Another factor to consider is pricing. Most breeders are exploiting innocent buyers because Pomeranian Huskies are rare. You need to find a breeder that gives you a reasonable price. You should also have room for bargaining. However, never trade with Pomsky breeder that does not guarantee a refund on deposit. You should only give deposits to a breeder that agrees to refund you in case of anything. Most importantly ask for a chance to chose your own puppy. Some breeders will want to choose for you. If you paid your deposit in advance you should be able to choose your puppy as soon as they are delivered. 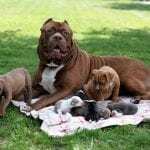 Generally, a good breeder should provide a good and hygienic environment for the puppies. They should also feed the dogs on home cooked foods and provide the necessary grooming and medication. Everybody wants to rescue dog from a shelter. The problem is that there aren’t many Pomskies to be rescued. You may be lucky if you find a lost Pomeranian husky mix and be given the chance to adopt. The good thing is that rescue homes and shelters will give you the dog as long it is available. They have no reason to hold on to a lost dog. However, the number of people looking to adopt Pomskies is very high. If you visit several rescue centers you may be lucky to find one or at least get on the waiting list. Generally, the cost of adopting a Pomsky is similar to other dogs. It usually ranges between $0 and $250 depending on the shelter. However, some individuals may take the chance to exploit you for more. If you chose to adopt a full grown Pomsky, take some time to look into heir character traits. As already mentioned, training a adult dog can be very hard. Finding Pomsky dog today is not as hard as it was in 2012. If you bought Pomsky puppies at that time chances are it was not an actual Pomsky. However, finding a Pomski today is pretty easy. There are a few options available to you. You can either choose to buy a dog from Pomsky breeder, buy one from an owner who wants to sell, Adopt one from a rescue center or a shelter. All the three options are viable depending on how much you are willing to spend, where you live, and how much information you have about Pomskies. If you are going to adopt a Pomsky, you need to know exactly how a Pomski looks like. The best option is always to buy from a breeder. However, breeders tend to be more expensive than the other option. You may have to settle for a different color, size or age of the Dog breed you wanted. You should, however, have the minimum requirements in mind. If you do not get one in a rescue center or a shelter net to you try a different shelter. The other option is being patient. Some rescue centers have waiting lists where you can wait until the dog you prefer comes in. If you have the patience just put your name on the waiting list and keep checking. Even in this case, do not be too specific on the type of a dog you want. Whichever way you find your Pomeranian husky mix, it is advisable to stick to the young ones. 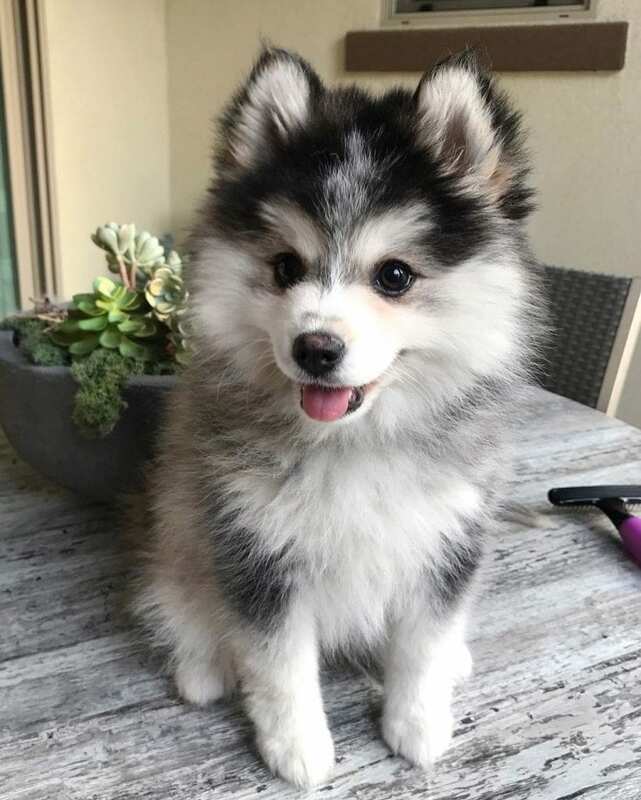 A Pomsky Puppy gives you the chance to nature him/her into the kind of dog you want. We all know that a dog is just equally a family member as the rest of the people at home. If the Pomski is trained in the way of the family, you will have much fun together than introducing a guest to your home.